If you don't have a round platter, pizza pans are a great option for making large antipastos. They are also great for taking along to parties and potlucks, because they are lightweight and unbreakable. Click on the link and you'll see lots of other size options, too. This handy gadget is adjustable and dishwasher safe. I never make a salad without it. I used if for thinly slicing the red onions for this antipasto. Easy, make-ahead, and a beautiful WOW on the table. It's great for lunch, dinner, or parties at home or to take along to picnics and potlucks. Spread lettuce out evenly on a large (approx. 16") round platter or pizza pan, leaving 1-2 inches around the perimeter. Scatter red onions on top of lettuce. 1. Cheese slices around perimeter of platter. 2. Salami and pepperoni evenly spaced on top of cheese around perimeter. 3. Baby corn and red pepper strips in star pattern from the center of the platter out towards the edge. 4. Mozzarella balls piled in center of lettuce. 5. Olives, pepperoncini, and garlic around perimeter on top of cheese and salami. 6. Artichoke hearts in spaces between the corn and pepper strips. 7. Tomatoes scattered near cheese balls in center. 8. Carrot curls around the perimeter. Drizzle dressing over salad before serving, or serve undressed with a pitcher of dressing on the side for each individual to add. 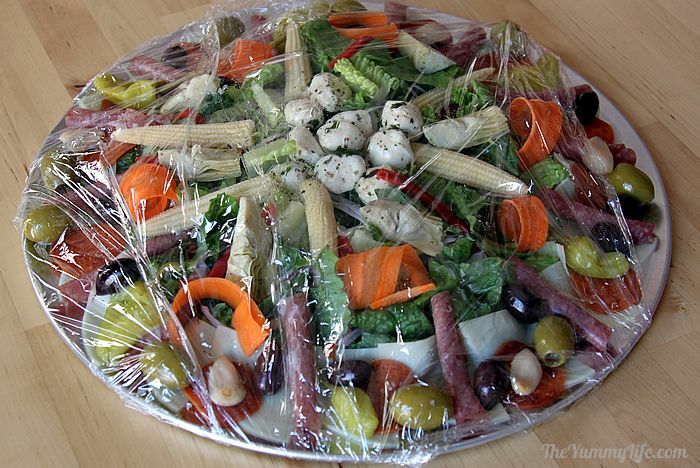 MAKE-AHEAD TIP: Antipasto may be assembled, covered in plastic wrap, and refrigerated for up to 4 hours before serving. I've mentioned in previous posts that my mom managed an Italian restaurant where my sister and I both worked in our younger years. 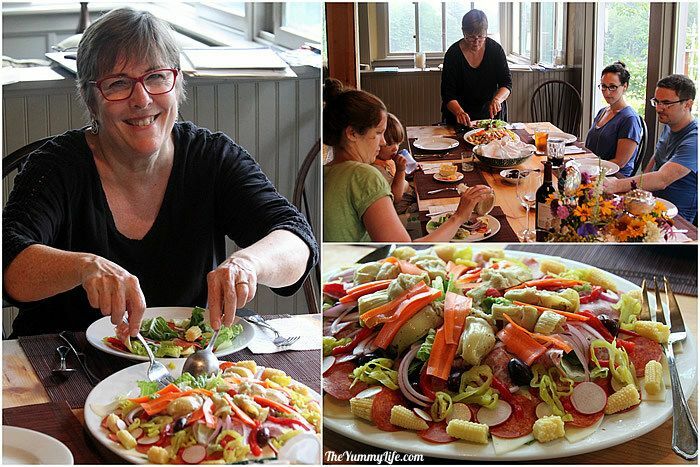 This antipasto salad was a very popular first course at that restaurant. It could be ordered on a big platter to share at the table, like I'm explaining in this post. Or, it can be made on individual smaller plates. 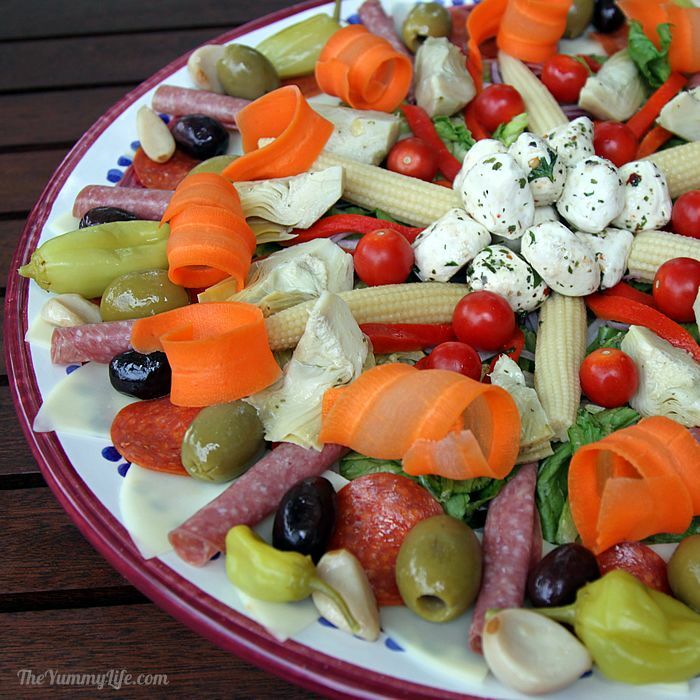 I love making and serving this antipasto; because, not only does the combination of flavors taste amazing, but the textures and colors make a beautiful and impressive presentation. It's always a WOW when I set this on the table for guests. 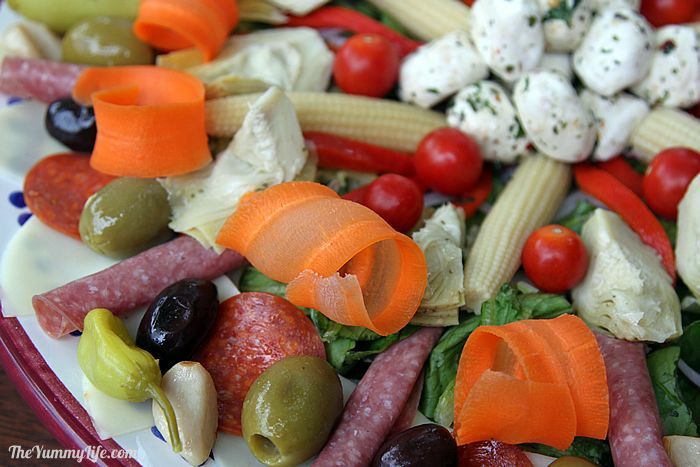 Traditional antipasto includes cured meats, pickled/marinated vegetables, and cheeses. This "salad" version also includes lettuce and a few fresh vegetables. Assemble ahead of time, so it's ready to serve. I love the convenience of being able to make this antipasto several hours ahead so there's no last-minute hustle-bustle pulling it together right before the meal. 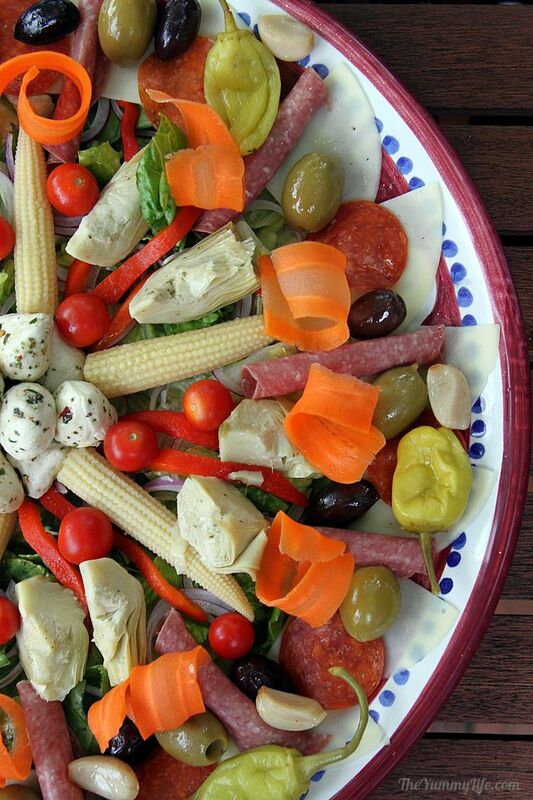 This also means that antipasto is great to take to a party or potluck. 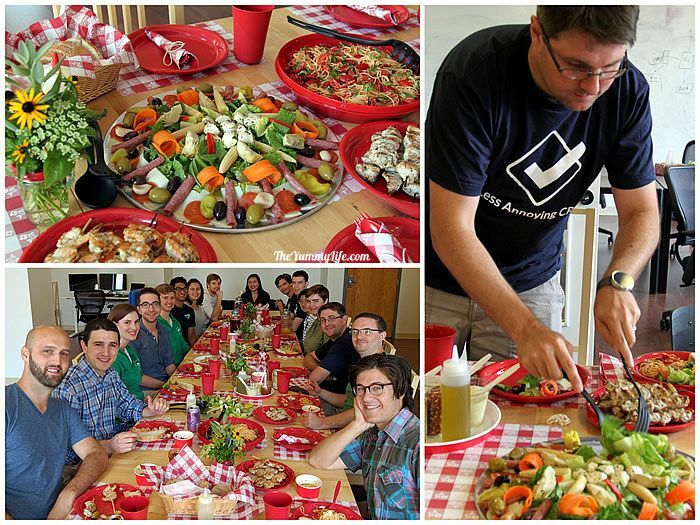 I recently made an Italian lunch for my sons' company, Less Annoying CRM, pictured below. As part of the make-ahead meal, I assembled 3 antipasto platters at home, held them in the fridge, and took them to serve a few hours later at the office luncheon. The menu also included my make-ahead Pasta with No-Cook Cherry Tomato Sauce. So Easy! There's really no cooking involved here. It's more of an assembly project--as easy as it gets. Gather the ingredients, and you're ready to create one of these beautiful, delicious salads. Nutritional Information. Sorry, but I can't advise you on that as I do in most of my posts. There are too many possible variations on ingredients, and their nutritional data can vary from brand to brand and with different preparations. My strategy when I'm trying to minimize calories is to use a small drizzle of dressing, eat more of the lettuce and marinated veggies, and enjoy just a small sampling of the meats and cheeses. Assemble the ingredients. In addition to tasting great, the goal of the ingredient selection is to create a variety of textures, colors, sizes, shapes, and flavors for arranging a pattern that is visually appealing. Select a variety of pickled and marinated ingredients. There are a number of choices available here. I show my favorites below, but feel free to customize the selection to your preferences. Include enough of each item so that each person can have 1 or 2 of each one. My recipe is for 6 people, so I include 6 to 12 of each item on the platter. canned pickled baby corn--Honestly, these aren't all that flavorful, but they add variety and big fun factor to the platter. I mean, they're really kind of adorable, right? Select some favorite cured meats and cheeses. I get mine at the grocery store deli so I can have them cut exactly the number of slices I want--no leftover waste that way. 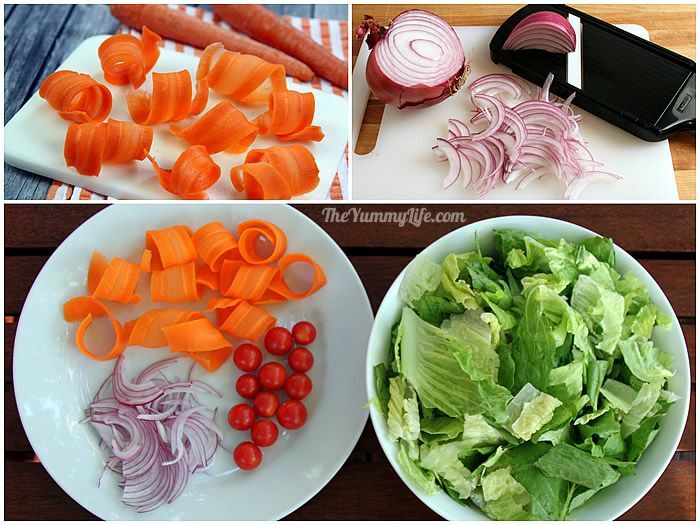 carrots curls - check out my post on how to make carrot curls; these add texture and variety to the antipasto platter, but you can also substitute thinly sliced carrots for a quicker, easier option. 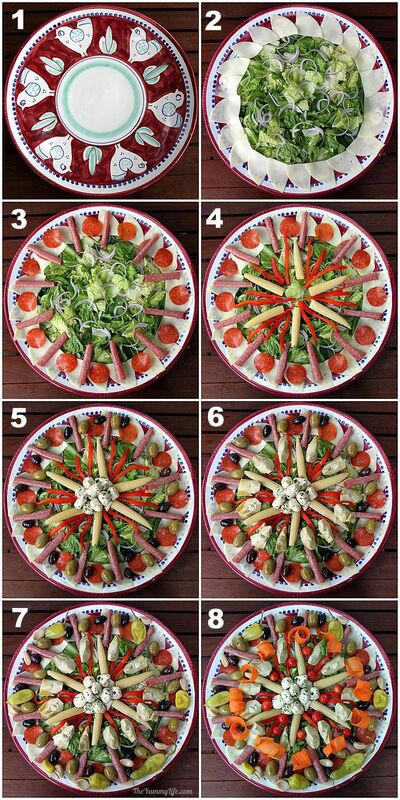 Arrange the antipasto on a large round or oval platter. I'm using a 16.5" diameter ceramic platter in the photos below. When I take an antipasto to a party or pot luck, I arrange it on a large pizza pan--a great size that is lightweight and unbreakable. 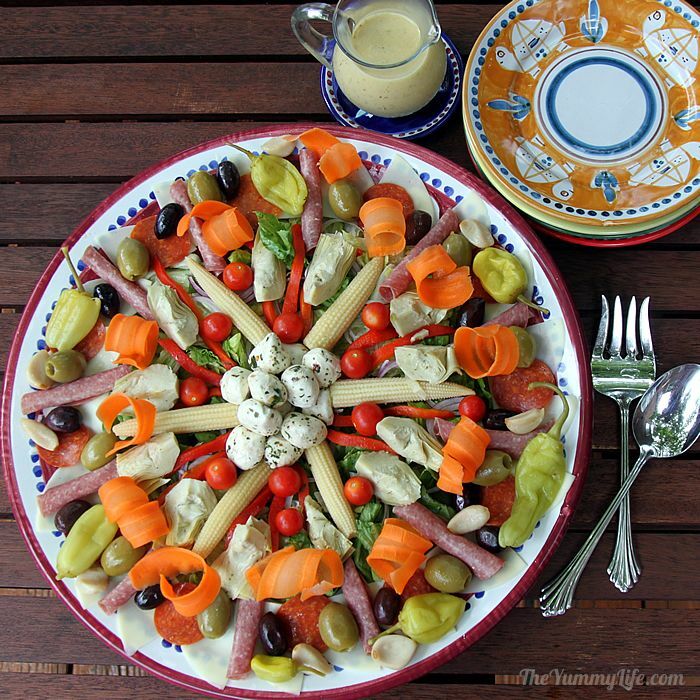 Add the antipasto ingredients, forming a uniform pattern with each around the platter. Create whatever pattern you choose. Start with a large round platter or pizza pan. Spread lettuce out evenly on the platter leaving 1-2 inches around the perimeter. Scatter with red onions. Arrange cheese slices around edge. 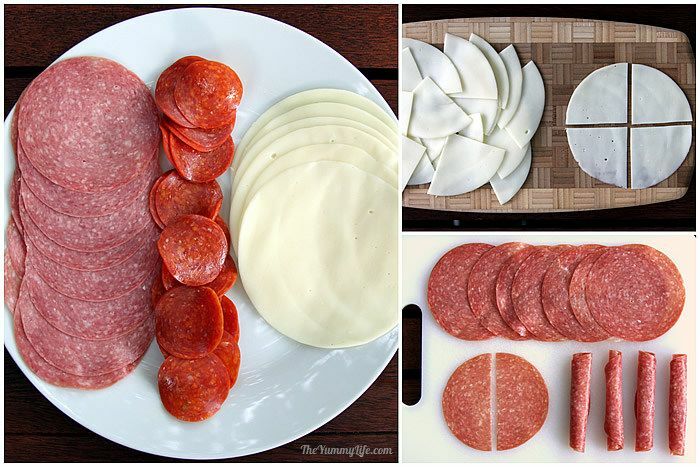 Add salami and pepperoni evenly spaced on top of cheese around perimeter. Add baby corn and red pepper strips in a star pattern from the center of the platter out towards the edge. Pile mozzarella balls in the center. Add olives around perimeter on top of cheese and salami. Place artichoke hearts in spaces between the corn and pepper strips. Add pepperoncini and garlic around perimeter. Scatter tomatoes near cheese balls in center and carrot curls around the perimeter. These flavors taste so amazing together. I usually serve the antipasto at the table by dividing it into individual portions on small plates, making sure to include a little of everything with each serving, and passing the plates around to each person. You can also pass the full platter around or serve it on a buffet table and allow everyone to pick and choose which ingredients they like. Dress it! 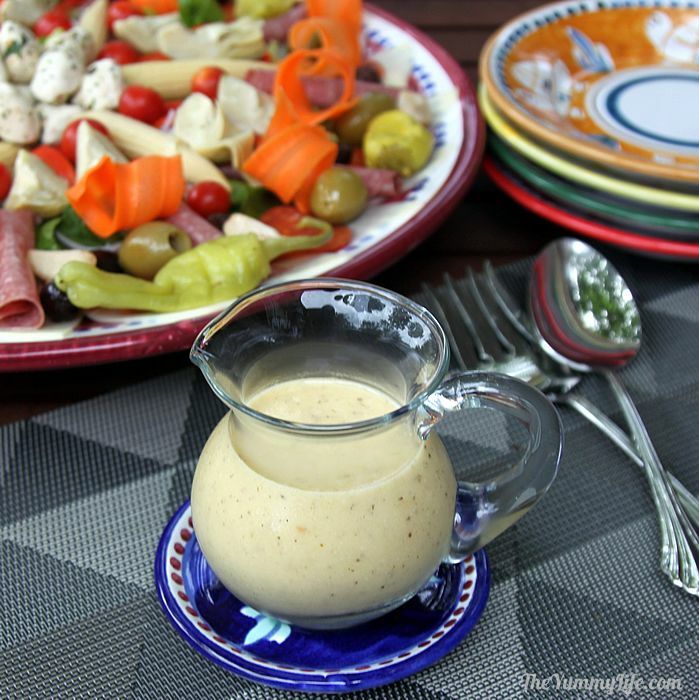 You can drizzle dressing on the antipasto before serving, or offer dressing on the side in a small pitcher or squeeze bottle so each person can dress their own. I use my Creamy Italian Dressing, but a simple oil and vinegar dressing like my Everyday Vinaigrette is tasty, too. Did you notice the fun Italian ceramic dishes I'm using for the antipasto? I purchased these on my Italy trip. Look for more info. about them at the end of this post. Make it a meal! Although I normally serve this antipasto salad as a first course of an Italian meal, it is hearty enough to actually be the meal. 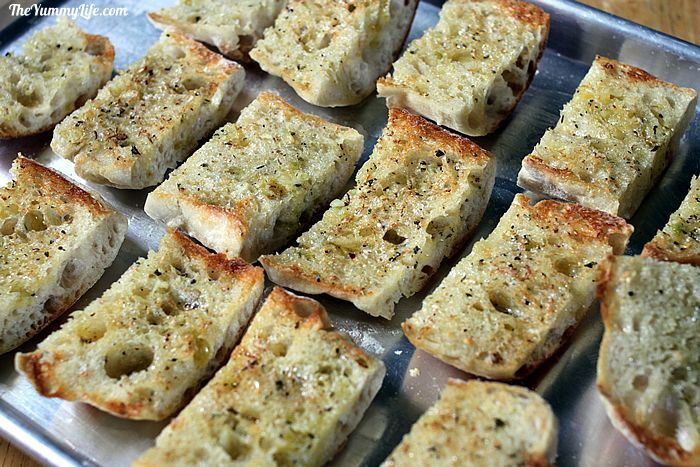 Combine it with garlic toast using my recipe for the Ultimate Garlic Bread Spread, and you've got a fabulous and easy lunch or dinner. Make it ahead! 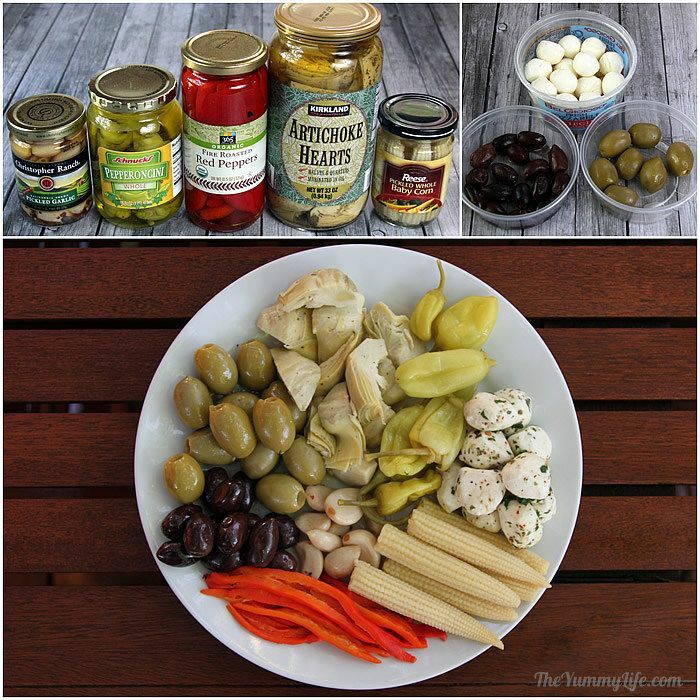 You can assemble the antipasto, wrap it in plastic wrap, and refrigerate it for up to 4 hours before serving. I love that convenience. Below is one of the three I arranged on a large pizza pans to take along to the Less Annoying CRM luncheon pictured at the beginning of this post. Pizza pans are a great option to take somewhere since they are light and unbreakable. A family favorite. We often have a big Italian meal when our entire family is together. Below are photos of us on a family vacation in New Hampshire last year. We were celebrating my daughter-in-law Rachel's birthday, and she's a fan of these antipastos. There's something fun and festive about them. I couldn't find all of my usual ingredients at the small country grocery store nearby, but we were able to make easy substitutions. The recipe really is very flexible. Whether you are a cook or not, you can certainly assemble one of these beauties. The combination of easy, make-ahead, beautiful, and delicious makes them a winner that everyone is sure to love. 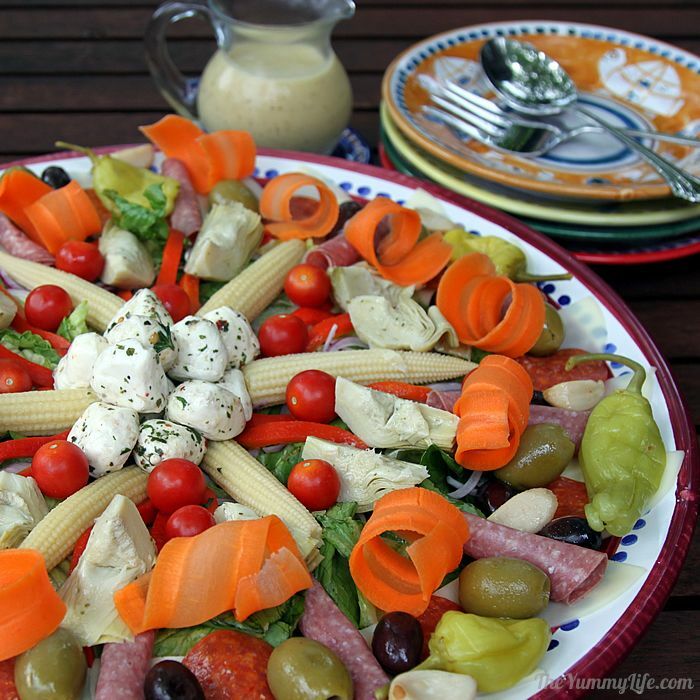 Here are my other Italian recipes that our family eats with this Antipasto. Did you notice the fun Italian ceramic dishes I'm using for the antipasto? After falling in love with these whimsical dishes at the Italian villa where I stayed on my trip, I just had to have some to enjoy back home. The friendly family that owns the villa also has a ceramics shop in Ravello called Ceramiche D'Arte Carmela, and they shipped my custom order directly to my St. Louis home. I use them every single day now. So fun! Every plate has different animals and colors--a very popular style of the Amalfi Coast area where I stayed. If you're interested in purchasing dishes from them, contact Roberta (my new friend there who manages the villa). You can message her via the contact page on their ceramics shop website. She speaks English, so communications are easy.